To give you more options for sources, we are offering three projects from the Bedford Digital Collections, bundled free with the purchase of a new text. This online repository of discovery-oriented projects offers both fresh and canonical sources ready to assign. Each curated project poses a historical question and guides students step by step through analysis of primary sources. 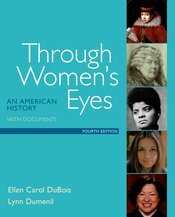 Revolutionary Women’s Eighteenth-Century Reading and Writing: Beyond "Remember the Ladies"